I decided to go with the "sweet romantic" theme for my second roomwear coordinate. This one is much more girly compared to the first one that's more casual and cute. 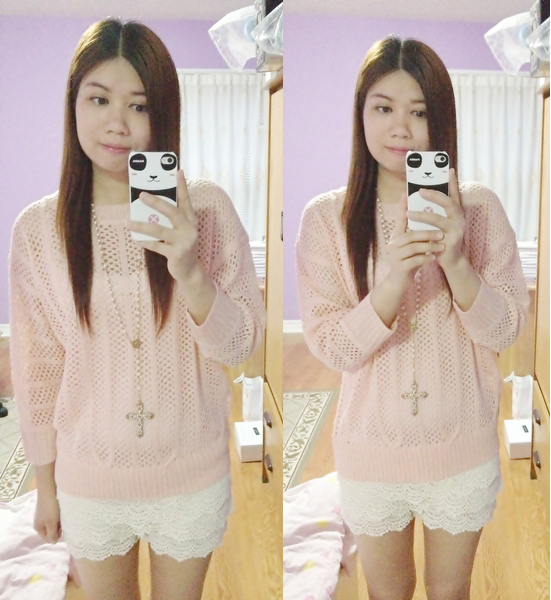 For the top I decided to go with an open hole knit pink sweater and layered lace shorts for the bottom. The combination of the two creates a very sweet and girly look. I also opted out the slippers and wore these pink pumps to match my pink top for a more feminine chic look. And lastly I added a gold pearl cross necklace for a soft romantic feel to complete the whole outfit.